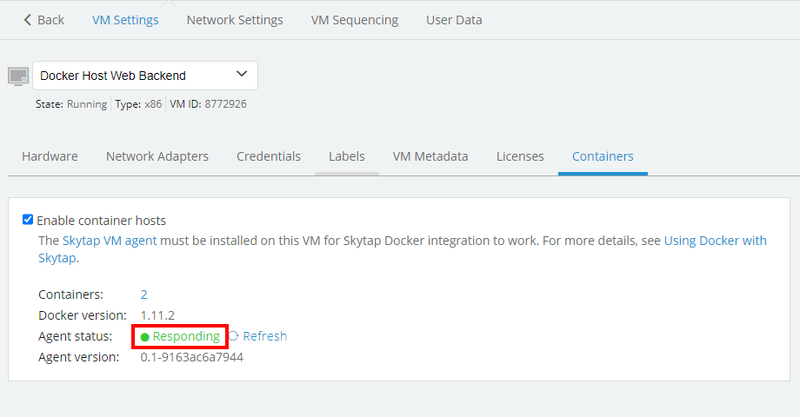 If Docker is already installed on a VM, you can see and manage any containers installed on the VM after you configure the VM as a Skytap container host. 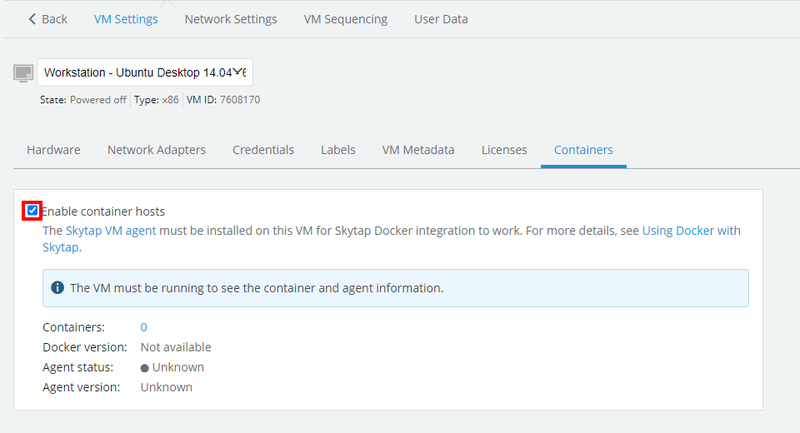 To commission a VM as a container host, you must install Docker engine and the Skytap VM Agent, and then check the Container Host box in the Containers settings for the VM. For more information about Skytap container host VMs, see About the Skytap container host. Containers are supported only on Docker-capable Linux VMs. Make sure that the OS of the VM is an x86 The most common type of CPU for Windows and Linux VMs in Skytap Cloud. Linux distribution that supports Docker. For a list of supported Linux distributions, see https://docs.docker.com/engine/installation/#supported-platforms. Install Docker engine v1.9 or newer. For Docker engine installation instructions, see https://docs.docker.com/engine/installation/. For CentOS, RHEL, or Fedora container hosts, you may also have to enable IP forwarding. See Enable IP address forwarding for a container host. If the VM Agent does not install correctly, see Troubleshooting the VM Agent. From the Environment details page, click (Edit VM Settings) for the container host VM. The VM Settings page displays. 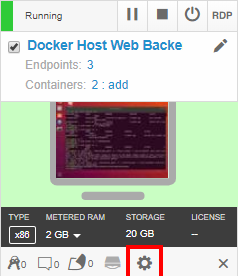 On the VM Settings page, click the Containers tab. Click Container Host, and then click Save. To verify that the VM Agent is responding. Click the VM Agent tab. Verify that the Agent status is Responding. If the Agent status is Unknown, click Troubleshooting to see Troubleshooting the VM Agent steps. In some instances it may be necessary to remove the VM Agent from a VM.